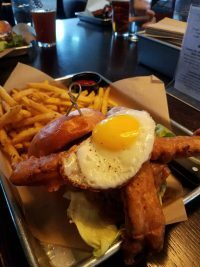 More and more great burger places are popping up in the Bellevue/Redmond area. It’s a delicious trend to behold. The first one (of the ones in this post) was Lunchbox Laboratory. They have a comical menu of awesome burger concoctions. Check out their menu to see what I mean. And don’t gloss over the side dishes. You can get creative and have them apply melted cheese, bacon bits and more to your tater tots or fries. Next up is Feed Co Burgers in Redmond. This place is great for a quick meal with a young kid in tow. You get a delicious burger and lots of choices of beers on tap, but you order at the counter so the total meal time is much shorter. Side dishes are great here too. Tyla always chooses the fried cheese curds. 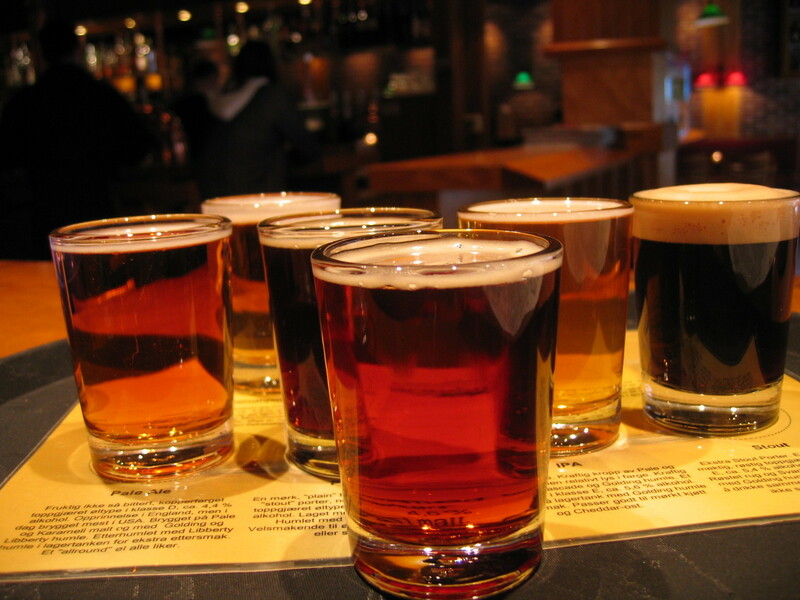 The newest entry is Tipsy Cow in Redmond. This restaurant combines the slightly hipster vibe of Feed Co with the bigger menu of Lunchbox Lab. Most recently, I had a burger with fried egg, fried bacon, caramelized onions and more (pictured). It’s awesome to see what all these places come up with in the realm of gourmet burger. Five Guys is a staple in my restaurant list, but if I’m looking for something a little fancier, all three of these places are excellent choices! I recently made this recipe for the first time and it instantly went onto our favorites list. Yum! It comes straight from the Betty Crocker website. I just modified the instructions a little because I need the dummy reminder to make the rice. Apparently having “cooked rice” in the ingredients list isn’t enough for me. 1. Heat oven to 350°F. Spray 13 x 9-inch baking dish or 2 1/2-quart casserole with cooking spray. 3. In 12-inch skillet, heat oil over medium-high heat. Sprinkle chicken with taco seasoning mix. Cook chicken in oil 6 to 8 minutes, turning once, until golden brown on both sides. Depending on thickness of chicken, it may not be cooked all the way through at this point but will finish baking in the oven. 4. In large bowl, stir together salsa con queso, half-and-half and chopped green chiles; stir in bell pepper. Reserve one-fourth of the sauce mixture. 5. Stir rice into remaining sauce mixture. 6. Place rice mixture in casserole; top with chicken. Top with reserved sauce mixture, then shredded cheese. Cover with foil. 7. Bake 20 minutes; uncover and bake 10 to 15 minutes longer or until sauce bubbles and juice of chicken is clear when center of thickest part is cut (at least 165°F). My standard cooking schedule for the week is to make something on Sunday that takes a little longer and gives us leftovers for a couple nights. Then on Tuesday or Wednesday, I make something quick in 20-30 minutes. It’s hard finding great recipes that only take that long, but I recently found this one and it quickly got added to our list. Deeeelicious and easy. 1. Cook and drain spaghetti as directed on package. 3. 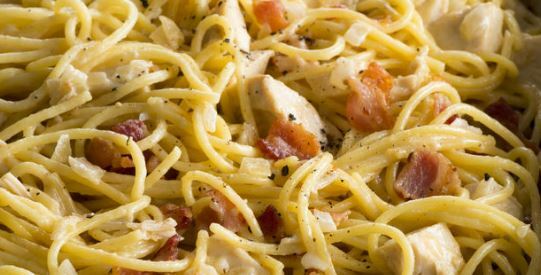 While spaghetti is cooking, cook bacon in 3-quart saucepan over low heat 8 to 10 minutes, stirring frequently, until crisp. Remove bacon from saucepan with slotted spoon; drain. Drain fat from saucepan, reserving 1 tablespoon in saucepan. 4. Cook onion and garlic in bacon fat over medium heat about 3 minutes, stirring frequently, until onion is tender. 5. Stir in spaghetti, chicken, cheese and whipping cream. 6. Cook, stirring occasionally, until heated through. Toss with bacon. 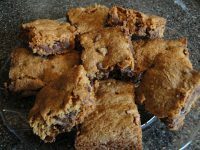 My mom always made a bunch of delicious Christmas cookies, but my favorite were graham cracker brownies. They’re so good! The recipe is really simple but it’s a good arm workout because of how thick and gooey the batter is. And the fun isn’t done after you pull them out of the oven. Getting them cut and removed from the pan is a workout too! But when you’re done… mmm…. a friend at our recent party said, “What is in these crack brownie things?!? !” Enjoy! Mix all together. Bake in a 9×13 pan for 25-30 minutes at 350 degrees. It’s easier to remove the bars if you use a glass pan. 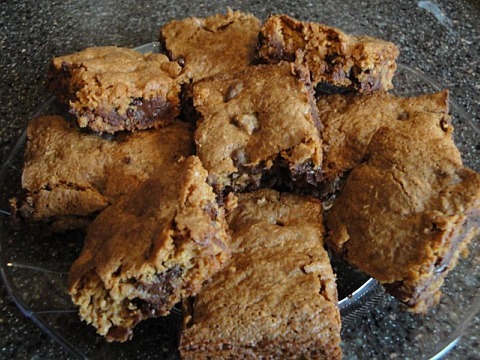 You’ll want to let them cool a bit before removing them from the pan because they will probably be too gooey at first. Other versions of this recipe have you had baking powder which would probably make it a little fluffier when it’s done, but I really like the dense result.